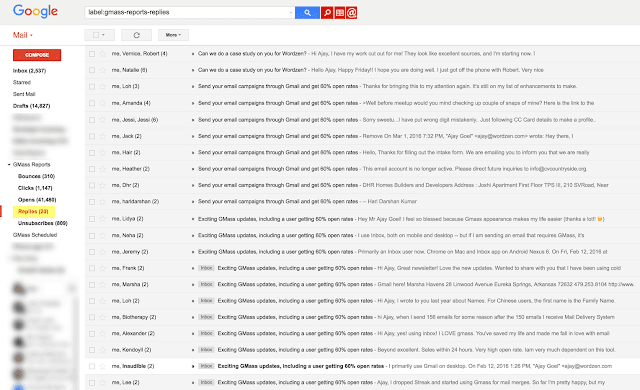 We’ve just launched a new feature which automatically organizes replies to your Gmail email marketing campaigns. Bounces, replies, block-notifications, and other types of replies received after you send a mass email campaign with GMass will now be categorized for you under the “GMass Reports” label. This means that you no longer have to sift through countless bounces and replies trying to determine which responses are the important ones you need to see. You’ll notice two new sub-Labels under “GMass Reports”: “Bounces” and “Replies”. Based on your particular email campaigns, you may also notice the sub-Labels “Blocks”, “Delays”, and “Over Limit”. Bounces: Bounce notifications indicating that an email address you sent to is invalid. These are removed from your Inbox and placed under the Bounces Label. Additionally, the bounced address is added to your account’s bounce list, and further attempts to send to this email address will be suppressed by GMass. This means that you no longer have to manually extract bounces from your Gmail account. (If you click the regular Gmail “Send” button, however, you can still send to bounced addresses.) You also have granular control over your account’s bounce list. See this post on how to manage your account’s bounce list or have your account ignore bounces. Replies: Human-based replies where a person clicked the “Reply” button and sent an email in response to your email marketing campaign. Replies remain in your Inbox and are also tagged with the Replies Label. Delays: Delays are a type of soft-bounce that occurs when Google is unable to transmit an email message but will attempt to later on. Usually “delay” bounces are received if the email server for your recipient is temporarily down. Delay notifications are removed from your Inbox and placed under the Delays Label. Blocks: Blocks are a special type of bounce indicating that your email was rejected because the receiving email server determined it contained spam like content. Block notifications will be rare since emails sent with GMass almost always land in the Inbox. Block notifications remain in your Inbox and are also tagged with the Blocks Label. If you notice blocks after sending an email campaign, contact our Support team so we can determine what is causing the block and how to resolve it. Over Limit: These are special types of bounces generated by Gmail indicating that an email wasn’t sent because your Gmail account has exceeded its daily quota. GMass attempts to prevent you from exceeding your limits to begin with, but in some cases your account may still generate these notificaitons. Over Limit emails are removed from the Inbox and placed under the Over Limit Label. GMass’s reply management system only works on replies/bounces sitting in your Inbox. If you manually move these from your Inbox and into a separate Gmail Label, or if you delete them before the GMass reply scanner processes them, then they will not be categorized for you. It can take anywhere from a few minutes up to a couple hours to process replies in your Inbox. If you see bounces, replies, and other notifications sitting in your Inbox after sending an email campaign, please wait a couple of hours for GMass to categorize them. This was a difficult feature to build, and I’m especially proud of the algorithm I derived and the computational efficiencies I achieved when writing the code for this feature. GMass already excels as the most powerful email marketing platform for Gmail and Google Apps, but now GMass is the only Gmail-based email marketing solution that can automatically manage replies. This feature also lays the groundwork for an upcoming enhancement to the follow-up campaigns feature. In addition to being able to send follow-ups to people based on whether they clicked and opened, you’ll soon be able to send follow-ups based on whether an email address replied or didn’t reply! I want to do some outreach, so evry mail will be some way personalized, I can't send in bulk. But after I send it I want to mark it to send an automated followup if they don't respond in 7 days. How I can do that? it is really great enhancement . Right now, there's no way to send an automated follow-up, but that feature is coming. Give me about a month or so. Ajay, this is great! In the followup campaign enhancement I would love to see the option to send to campaign recipients that "did not open"
how to send mass email in gmass without showing addresses? Just put your addresses in the To field and hit the GMass button. Is there any way to stop a gmass email once it's been sent please? I sent one to 5,000 people in increments of 1900, but gmail has put a hold on my account for sending out more than 100 at a time. It's causing me problems. Thanks. please add another function subscriptions. connect google-forms and Gmass or more ..
that I could place on my site. yesterday I started using GMass. So far, I am pretty excited of all the options it offers. But I also ran into trouble already :). Can I somehow manage my "account's bounce list"? At least clearing it and starting over would be fine. The reply detection seems to have a problem. I’ve received a few replies in the inbox from my campaign (including the one I sent from my other email, just for testing), but in the reports I still see 0 replies. Then, when I try to create a follow-up campaign, in the selection for the “Behaviors” I also see “Replies: 0”. Bounces are being returned to my inbox, not the Gmass Bounce folder, and they are not being processed by Gmass (at least, they are still in the inbox, hundreds of them). How can we correct this procedure? Bounces go to your inbox so that you’re aware you’re getting them. You can set a filter to have them skip the inbox if you prefer not to get them. Hi, something is off with this Replies statistics. It shows in report that were over 30 replies, but there are nowhere to be seen. Not even in the Replies folder. How is that? Is gmail blocking emails or is just some auto-confirmation that the user received the e-mail, but it shows as reply in gmass. Please contact our support team through http://gmass.co/g/support with the campaign ID of the campaign that you’re experiencing these issues with.